The Fiat 500C formula harks back to the 1957 "Nuova 500" styled by Dante Giacosa, which was sold with a full-length retractable roof. With the green credentials of the new 875cc engine TwinAir engine, can it give the chic 500 21st century relevance? I spent a week with the £15,500 Lounge to find out. 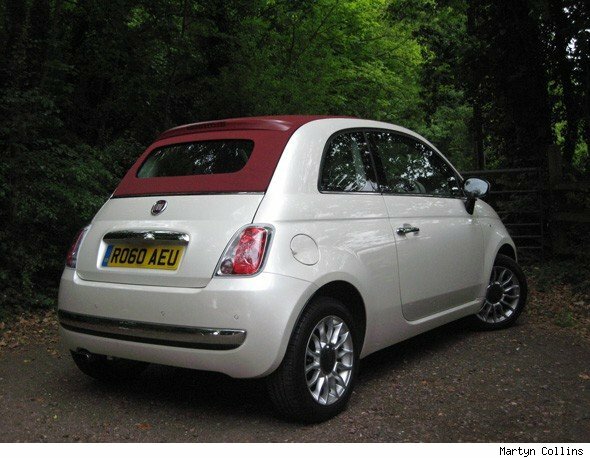 The 500C dates back to 2009, but the 500 hatch on which it's based, dates from a year before. The only change over the standard 500's cheeky styling is a slightly deeper front windscreen; this is to improve visibility and hide some roof bracing. Our test car was fitted with the latest TwinAir engine available for both the 500 and 500C. The new 85bhp 875cc engine has two cylinders, a turbocharger and stop-start system. These combine to give emissions of 95g/km and 68.9mpg fuel consumption figures; so if you're looking for a stylish but cost-effective car to run, the 500C TwinAir scores highly. The 500's steering is a big disappointment; electrically assisted, it's too light and feels strangely artificial around the straight ahead. 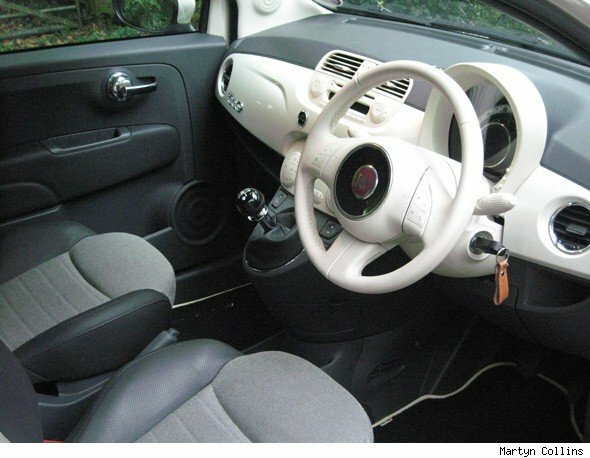 Parking is generally easy in the little Fiat, with its City Steering button and small dimensions. However, rear visibility is compromised because of the convertible roof's smaller screen; good thing rear parking sensors are standard. 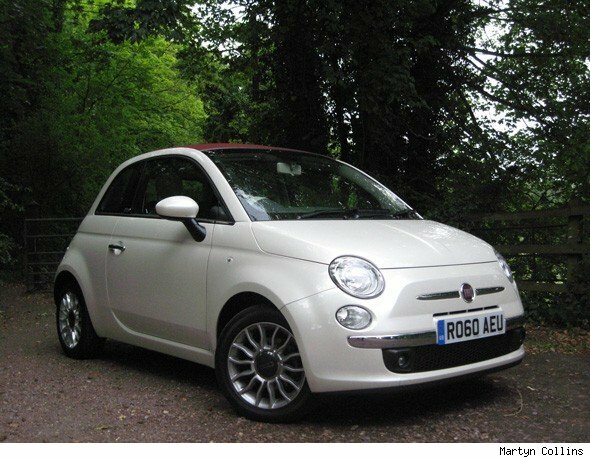 Usually lopping off the roof can interfere with a car's dynamics, but surprisingly I found the 500C to be the sweetest handling version of the baby Fiat I've tried. The ride isn't choppy and the 500C TwinAir is a confident handler. Like the hatch, I was impressed with the 500C's attention to detail and the standard of fit and finish. I love the dashboard with its colour-coded trim but the driving position could be better and the dials although unique, are not easy to read at a glance. The TwinAir engine doesn't feel too different from the bigger 1.4 around town, however if you rev it you get an distictive Citroen 2CV-like, two-pot soundtrack. The noise can get tiring on the motorway, but its free-spinning nature is surprisingly good fun. It's torquey too. Working the engine hard also means you'll be making the most of the rubbery, imprecise five-speed manual transmission with its short ratios. The 500C is no fireball in the performance department; 60mph comes up in a less than admirable 11 seconds and the top speed is 107mph - if your ears can take it. The 500C's doors open wide and considering the folding roof, there's actually still enough room for two in the back. The boot is almost the same size as the hatchback at 182 litres, but the opening is more compromised. There's a split/fold rear seat to increase practicality. The 500C Lounge trim includes remote central locking, air conditioning, electric front windows, ABS with EBD, power steering, height-adjustable steering wheel and seat, driver, passenger, side and knee airbags. The standard-fit, six-speaker single-disc CD player sounds good and if that's not enough, there's a Blue&Me USB and Aux-in port to play your MP3 player through. A navigation system is available as an accessory. 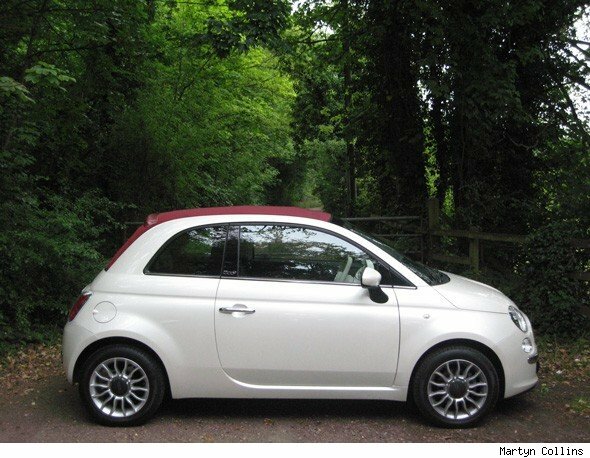 To sum up, this 500C's TwinAir proves that being frugal can still be fun. However, because it offers such enthusiastic performance, you'll struggle to match the claimed fuel consumption figures.